(PhysOrg.com) -- Scientists can now listen to a set of solar wind data that's usually represented visually, as numbers or graphs. University of Michigan researchers have “sonified” the data. They've created an acoustic, or musical, representation of it. The researchers’ primary goal was to try to hear information that their eyes might have missed in solar wind speed and particle density data gathered by NASA’s Advanced Composition Explorer satellite. 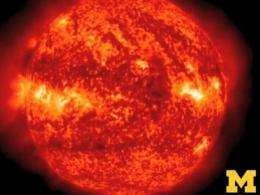 The solar wind is a stream of charged particles emanating from the sun. The process of sonification isn’t new. It’s how Geiger counter radiation detectors emit clicks in the presence of high-energy particles. “What makes this project different is the level of artistic license I was given,” said composer and recent U-M School of Music alumnus Robert Alexander. In effort to examine solar data in a new way, researchers worked with a composer to sonify information from NASA's Advanced Composition Explorer Satellite. The resulting music is part art, part science. The product, which Alexander says is “in between art and science,” sounds appropriately primal and otherworldly. In one version, Alexander used what he describes as a tribal drum beat to represent the rotation of the sun, and he layered the voice of a singer (his sister) to represent the charge state of carbon atoms, for example. 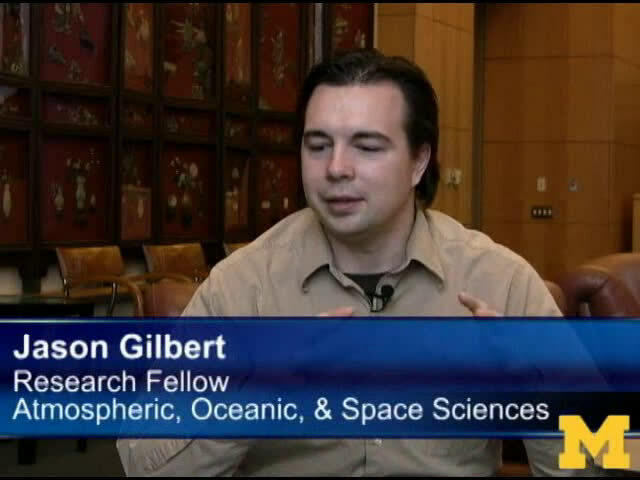 The solar wind fills the solar system and interacts with the planets, said Jason Gilbert, a research fellow in the Department of Atmospheric, Oceanic and Space Sciences. On Earth, solar storms can disrupt power on the ground and on satellites. Scientists study it in part to improve their predictions about how it will behave. “In this sonification, we can actually hear in the data when the temperature goes up, or when the density increases,” Gilbert said. While the researchers didn’t detect new information in this initial experiment, they see possibilities. “I am excited for sonification’s potential in research, but I think more work will need to be done to realize that potential,” said Jim Raines, research computer specialist with the Department of Atmospheric, Oceanic and Space Sciences. “To me, this project exemplifies what U-M is about: creativity reaching seamlessly across many fields to create something new,” Zurbuchen said.